Standing at six stories tall, the new Health Science & Graduate (GHS) building catches the eyes of students walking on campus. After a year-and-half of construction the building is now the new home to the Nursing program and newly established Physician Assistant (PA) program. “The building is the new home to the PA program, the well-established nursing program, and regular classrooms for regular courses,” said Paul Greenwood, dean of the College of Natural & Health Sciences. 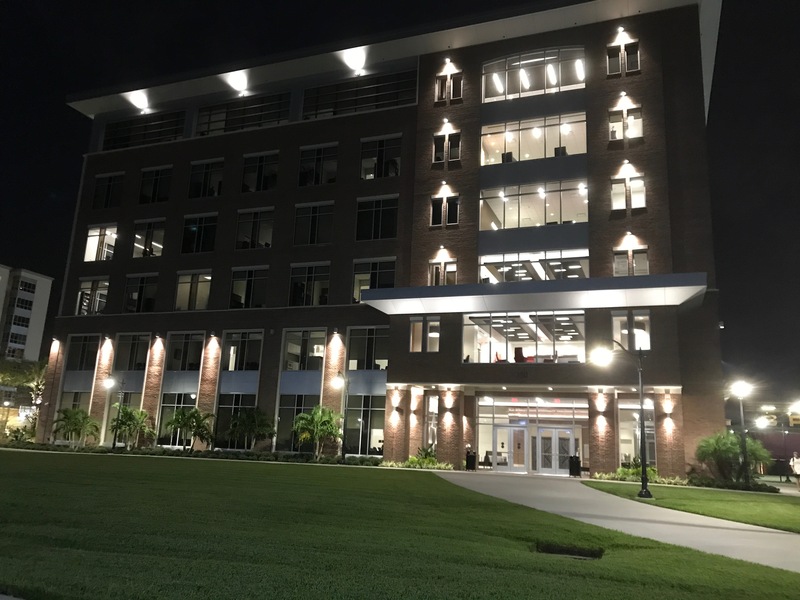 Dubbed as the tallest purely academic building on campus, GHS has two classrooms of 72 seats and three classrooms of 48 seats each on the first floor that Greenwood said are open for any department to use. “This [building] allows for all new equipment for them [students] and a much more open area, so it really helps the teachings,” Greenwood said. Especially when it comes to fourth floor which Greenwood called the jazzy fourth floor. The jazz refers to all the new equipment the nursing program received, and the new simulation center that is based on the fourth floor. “All the biggest pieces there are new. All the simulation equipment is new, all of the beds are new, all of the emergency room and ICU furnishing, and equipment are new,” Greenwood said. Both the nursing and PA students will be able to use the simulation center that are equipped with different model mannequins that are meant to simulate real patients. Director of The Nursing Skills and Simulation Lab, Melissa Culp showed off three of the mannequins that students will be working with. One of them, Granny, is a static mannequin meaning there is no technology in her making her a low-fidelity patient. She’s the mannequin students start with to get general experience such as transferring the patient from place to place. Granny has moveable joints to help with some simulations but has her limitations. She’s one of the mannequins that can’t take fluids in her said Culp. Juno, a mid-fidelity mannequin, however, is one of many mannequins that have customizable scenarios to simulate several medical conditions. She has heart, lung, and bowel sounds, and has a unilateral pulse on her right arm. But that’s not all Juno can do. Student will practice inserting a nasal gastric tube through the mouth to go into stomach and get stomach content out, according to Culp. Another unique feature of Juno is that it is one of the mannequins that can speak. “What is your pain on a scale from 0-10 where zero is no pain, 10 is the worst pain of your life?” asks Culp. “Seven,” responds Juno. When asked what the pain feels like, Juno answers sharp. Culp demonstrates what students will be practicing with Lucina, a high-fidelity mannequin. Lucina is named after the goddess of fertility because she’s one of the few mannequins capable of giving birth. “Students can go through an entire birth scenario with Lucina. With complications like postpartum hemorrhage, shoulder dystocia and other common events that happen in labor and delivery scenarios,” Culp said. Lucina has contractions that you can feel, and has OLED eyes that can be changed to simulate different conditions. She can take fluids via IV and reacts to medicine just like a real patient would. Lucina can even have a seizure to simulate a high-risk delivery. All these simulations and feature on the mannequins are controlled on an iPad or computer to customize each patient to different conditions. The GHS building, once fully open, will have immersive training for nursing and PA students. “Simulation use is very well established in nursing education and working with simulated patients before real patients is a good way to go,” Greenwood said. Nursing students will soon be able to get their hand on this new equipment, in the meantime Culp is busy arranging and testing out the mannequins to get everything ready. Once the simulation center is open Culp hopes it will inspire more students to join the nursing program.